A few years ago, the company was toying with what it called the E scooter, an electric scooter. To put things back into perspective, this was a time when German car manufacturers were less than lukewarm about the electric car. Most said there was no future in it and instead poured billions into the eventual fuel cell technology using the difficult to make, store and keep stored hydrogen. Fast forward 3 to 4 years and BMW has proudly announced a small electric car, EV the i3 and a stunning plug-in hybrid, PHEV, the i8. It also has an electric bicycle of sorts, the BMW I Pedelec. The C Evolution brings a electric scooter into the portfolio. Electric Scooters. It might be hard to remember but at one point, electric scooters were all the rage. Back in the prehistoric electric car time of 2008, electric scooters were seen as the beginning of the onslaught of electric vehicles. Companies such as Vetrix had an amazing electric scooter that featured regenerative braking. BMW’s C Evolution brings in a few intelligent features. BMW’s C Evolution. A neat feature I’m sure will please everyone is that the C Evolution can be charged up to 70% in about 30 minutes. The best part is that its charge socket is J1772 compliant. With an electronically limited speed of 75 mph, about 120 km/h, this scooter is perfectly capable of highway cruising and definitely should have no problems overtaking those old gas guzzlers. With its low center of gravity, thanks to its electric drivertain, its instant electric high torque makes it more of a maxi scooter easily matching 600 cc and over. Technically Speaking. Its electric motor puts out a respectable 11 kW, that’s 14.75hp. But its peak output is even more impressive with 35 kW, that’s 47hp! Its range is not shabby either with 62 miles, or 100 kilometers, all of this using a 8 kWh battery pack. It sports braking regeneration, as well as other intelligent systems that save power when the throttle is closed. The electric scooter is so well engineered, as what we’ve come to expect from BMW’s motorcycle arm that you can feel the torque braking when you let go of the accelerator. BMW is on the hunt and will take no mercy it seems when it comes to the electric drive. It is impressive to see how far a lead the company has taken over the years, compared to its mild local competition. 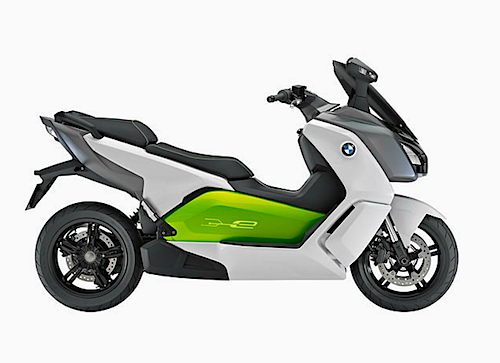 I look forward test driving the BMW C Evolution electric scooter soon. This is great news; and a large pack means plenty of range, though I'm sure the price will reflect this as well as the marque. BTW; the excellent Vectrix Scooters are being sold again with, Lithium Battery Packs now. And they lead the industry on innovative regen activation with twist forward of the throttle.